In this page, we show various of products that we have made. On the far left column, the products are various cast irons, from machinery parts to decorative items. There are crane wheels, made with high strength steels. Cases and components for air compressors. Damping weights and socket clevis used in electrical indutries. Hydraulic cylinders and hydraulic piston rods. In the middle are bolsters for rolling stocks (railroads). In the middle section are some machine parts, for example, gear cases, hinges, cases for band saws, train wheels. There is a cast iron pan as well. On the far right column, the top are the column for machine tools, made from high strength ductile iron. Following with the machining of side plate for large paper shredder made from Cr-Mo-Steel. 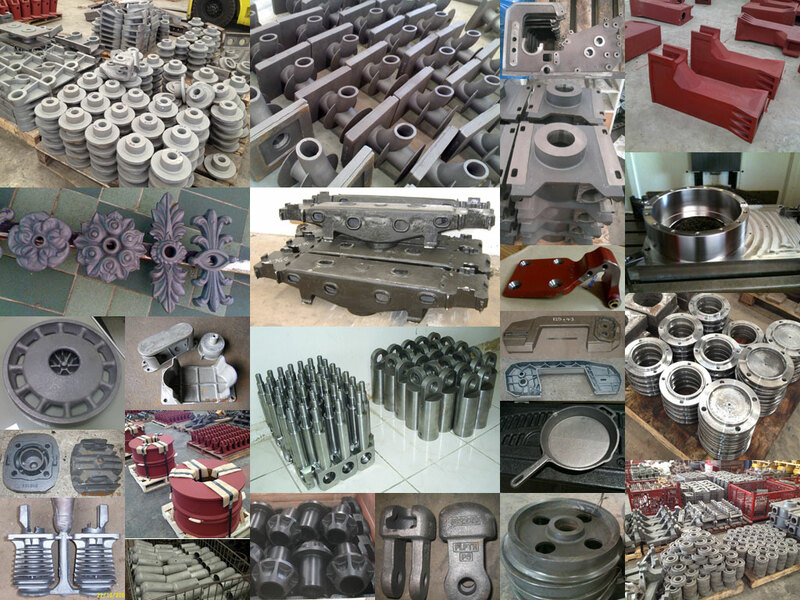 The rest are some of machined parts and some raw cast irons and ductile irons.